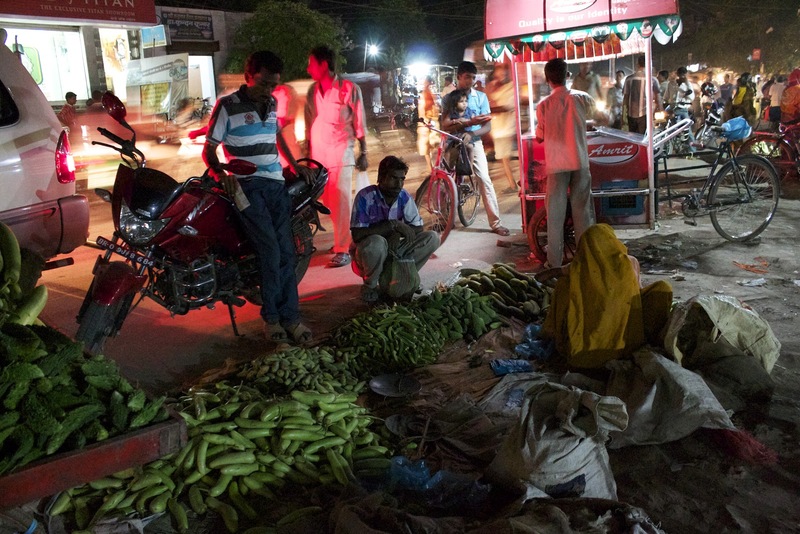 This story is set in a small but bustling town of Bihar. Its a story of a certain set of informals (informal citizens), people who do not own land, have no address, pay no taxes and contribute nothing to the physical infrastructure of the town but are critical for its social infrastructure. The vegetable vendors, Raju, Razia, Dulari, Prakash and Santu (from top to bottom). Every evening you can spot them at the same place, same time. They share the profession, the streets and the informality. What they never share is their spot and their lights. While Raju sits on his thela (push cart) under the electricity transformer, ironically in the dark, Razia sets up her shop on the ground, by the road in front of the big watch show room. Strategically placed, she benefits from the shop lights (notice the ice cream trolly near her). Dulari has no such benefits. 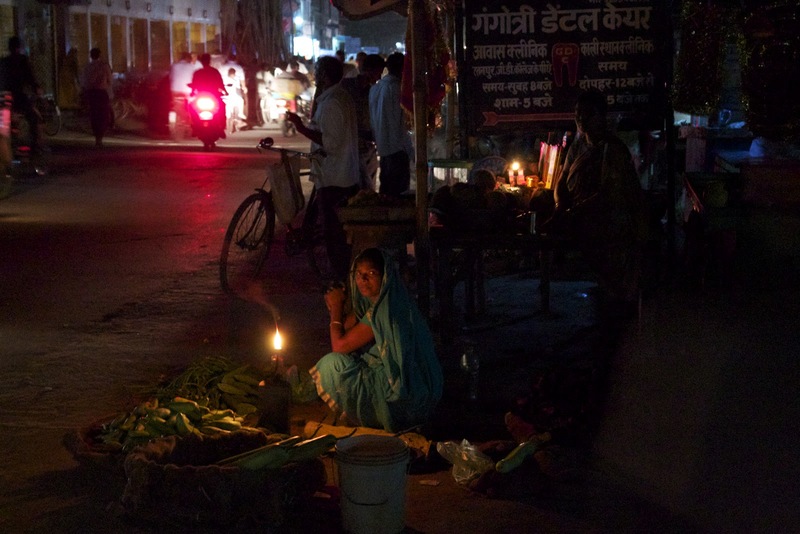 She sits near the temple, trying to light up her vegetables with some help from her modest dibiya (an oil lamp made by filling a small bottle with kerosene and putting a wick through the cap). Asarfi, Dulari's next door neighbour has some bamboo mesh walls in the name of the shop but what stands by her for light is her trusted dibiya too. In the big league, Prakash owns something that takes a step further from Raju's darkness and Dulari's dibiya. He owns a petromax, a gas petromax at that. These less ancient lamps have a mantle, to which gas/kerosene is supplied from the cylinder below. It certainly gives better light but turns out to be more expensive than darkness, strategic placement of the shop and dibiya. This takes us to Santu and his prime location with modern lights of electric bulbs. There are others like Santu around him who benefit from this prime spot and its electric lights. Indeed a look at the pictures gives us some idea of the importance of lights for these people. Santu, because of his infrastructure and Razia, due to her strategic placement command more customers. When I clicked this picture, Parkash was walking towards the back side of his thela to pick up his tarazu (balance) as some customers had arrived. 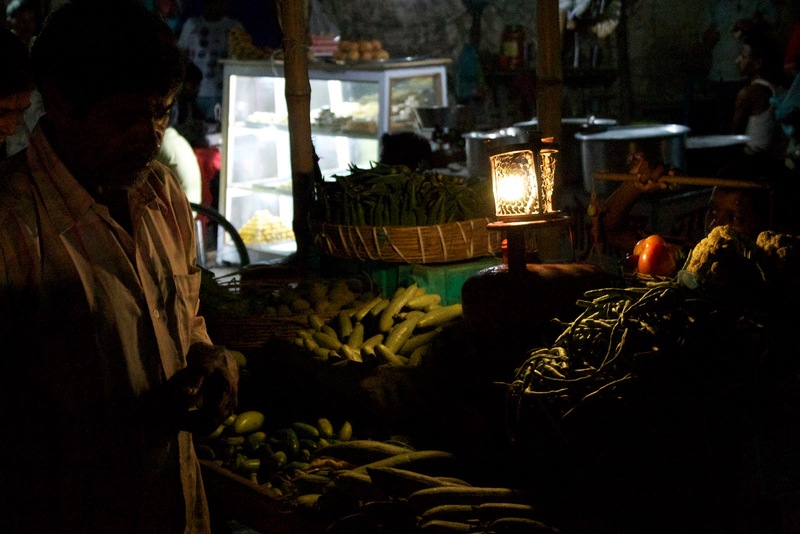 On being asked Raju told me that Santu and the likes were selling vegetables Rs 5 expensive as they had to pay for the generator connections for their electric bulbs. They don't have electricity supply from the government. After all they are informals with no claims over the government infrastructure. However, informally, they claim their spots. Raju said exasperated, "If I take their spot, they will chase me away." A certain form of association seems to be at work here, a association of certain informals claiming a formal spot and the benefits of lights with it. Raju seemed saddened by the lack of light at his spot. His next door neighbour, an old man with a heap of garlics on his thela agreed that light attracts customers. He remarked, "model jug hai na sir" (I think he meant, "its modern era sir"), "If I put a light here, my garlics will shine up to the kali asthan (a Kali temple about 100m away) and people will talk about them. If it shines, it sells". All of these people are vegetable vendors, all informals, all critical for the town's functioning. They struggle in their own ways to light up as they understand the importance of lights for their business, as do their customers. Can these informals, providing critical services to the town be provided with formal lights by the government? 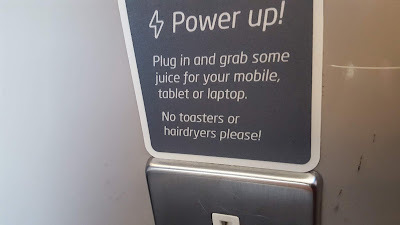 I am not so sure about that. 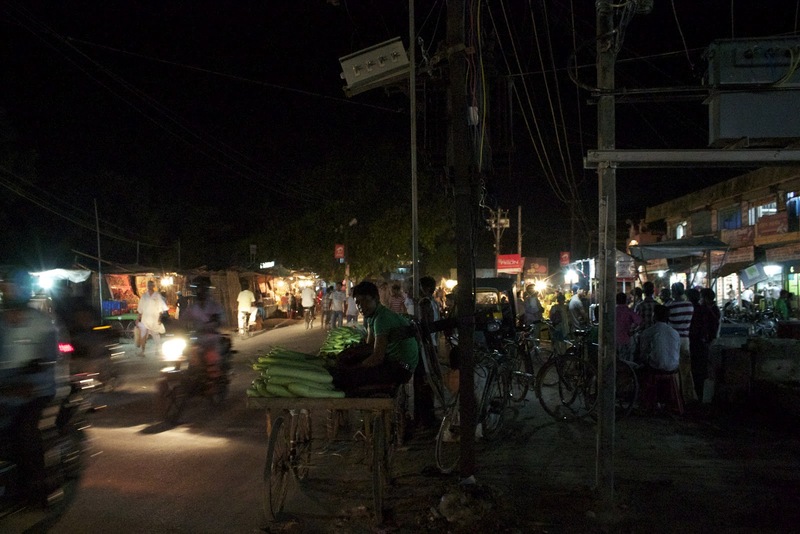 It is especially tricky in a town where even formal citizens don't get enough electricity for light, a town which virtually runs on diesel generators. 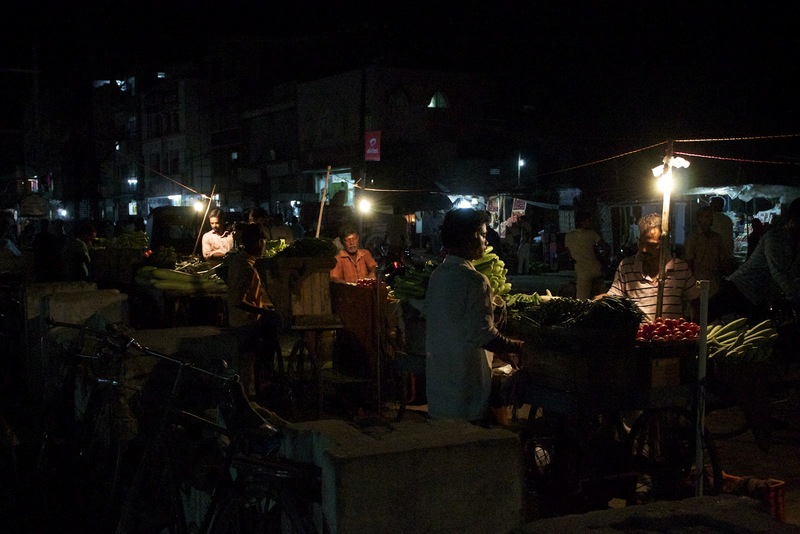 This post was first published on my other blog stories of lights on 6th August 2012. This reposting is a part of a plan to merge the two blogs at a later date. Lovely pictures and great storytelling. The stories of claims over space and light bring the pictures to life. 'If it shines, it sells', is particularly revealing.